Mount Vernon, VA – Raising a glass to celebrate the Scottish heritage of American distilling, three of Scotland’s top distillers today joined with a representative of the Scottish Government, Mount Vernon, the Distilled Spirits Council and the Scotch Whisky Association in previewing the first-ever Scottish-style Single Malt made at George Washington’s Distillery. The Single Malt distilling project began in the spring of 2012, when the Distilled Spirits Council of the United States (DISCUS) and the Scotch Whisky Association brought three of the leading Scotch distillers to Mount Vernon to partner with George Washington’s Distillery. The select team of Scottish and American distillers included Dr. Bill Lumsden, Director of Distilling for The Glenmorangie Co.; Andy Cant, Distillery Manager for Cardhu Single Malt Distillery, heart of Johnnie Walker blended Scotch Whisky; John Campbell, Distillery Manager for Laphroaig Distillery; and Mount Vernon Distillers David Pickerell (former Maker’s Mark Master Distiller) and Steve Bashore. The whisky-making process began in March 2012 by grinding one ton of 100% Scottish malted barley, both peated and unpeated, in George Washington’s reconstructed, water-powered gristmill. Using 18th-century methods, the distilling team produced 10 gallons of whisky considered to be of such fine quality and proof that a second distillation was unnecessary. This whisky was barreled immediately as Distillers’ Reserve. An additional 10 gallons, barreled as Limited Edition, was then distilled twice. The whiskies were aged at Mount Vernon for a total of three years in used Bourbon casks, re-coopered in Speyside, Scotland, and in the final months, were aged in barrels that previously held Madeira wine, which was a favorite at Washington’s table. A set of the rare bottles, both #1 of 30 of the Distillers’ Reserve and Limited Edition, will be the featured item auctioned tonight to raise money for Mount Vernon’s educational programs at DISCUS’ 14th annual “Spirit of Mount Vernon” industry gala. Remaining bottles will be sold for charitable purposes. Donnie Jack, Scottish Affairs Counsellor for the Americas based in the British Embassy, commented, "The links between Scotland and the USA go back to the founding fathers. Like our national drink, Scotch Whisky, the bonds between our two nations have matured over time. Today's celebration of the close collaboration between Scottish distilleries and the distillery at Mount Vernon is testimony to the enduring nature of our relationship which, I am convinced, will continue in the future. I congratulate all those on both sides of the Atlantic for their efforts, and I hope that the first bottles being auctioned for charity will attract considerable interest." Cardhu Single Malt Distillery Manager Andy Cant stated, “I am truly honored to represent the Cardhu Single Malt Distillery and our Scottish roots in this incredibly unique and exciting project. I have been eagerly waiting for the moment to try this first-ever Scottish-style Single Malt Whisky from Mount Vernon among such esteemed company and industry colleagues. This was such a fantastic collaboration, as we were able to uphold tradition but also push new boundaries for Scotch Whisky enthusiasts.” Cardhu Single Malt is the heart of Johnnie Walker blended Scotch Whisky. The Single Malt distilling project was supported by a number of other companies and individuals who contributed bottles, closures, bottle design and packaging, including Owens-Illinois, Inc.; David Cole Creative; Tapi USA; Trysk Print Solutions; and artist Lee Boynton. In 1797 George Washington's farm manager, a Scot named James Anderson, convinced his employer that producing whiskey made from corn and rye grown on the plantation would be a natural complement to his milling business. Washington was initially skeptical but soon granted permission to build the 2,250-square-foot distillery, making it among the largest whiskey distilleries in early America. By 1799, Washington produced 11,000 gallons of whiskey, worth the then-substantial sum of $7,500. The distillery ceased operating in 1814 when the building burned. Beginning in 2000, with a $2.1 million grant from the distilled spirits industry, Mount Vernon began the excavation and restoration of the distillery. In the Fall of 2006, the distillery was officially dedicated at a ribbon-cutting ceremony presided over by Britain’s Prince Andrew and then-Virginia Attorney General Robert McDonnell. 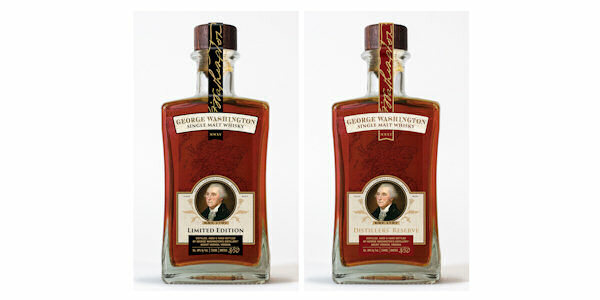 Previously, master distillers have recreated George Washington’s Rye recipe, with the first two bottles selling for $100,000 in 2006. Since then, small batches of limited edition Rye have been produced periodically and sold to the public. Other specialty distilling projects have produced Rum, Peach Brandy and Apple Brandy. All of these were distilled spirits Washington either sold commercially or entertained with at the mansion table.